So, I had the day off of work today. It was incredible. I haven’t taken a full day off in a long time and I had an extremely stressful week last week, so I could not wait to relax! I did find a few things to do around the house though. One of the things on my to do list was to clean my shower! 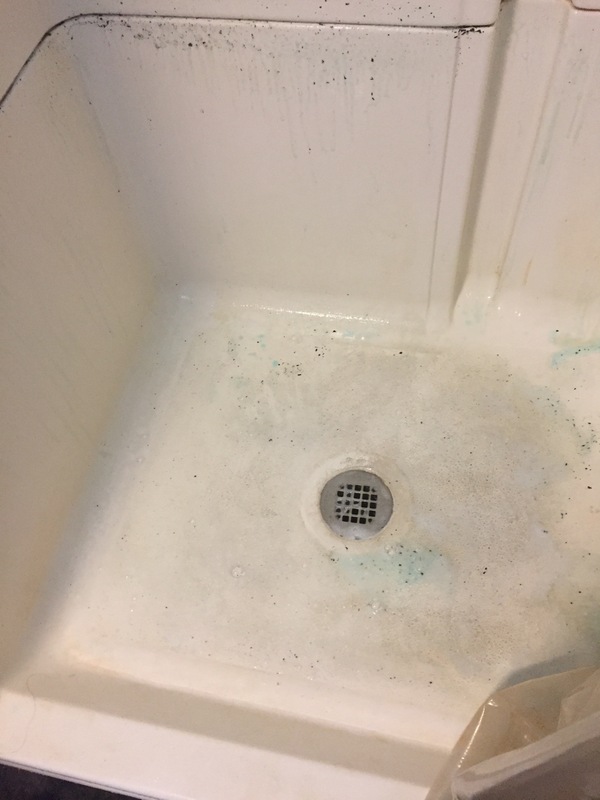 My mom suggested to me before that I use a Pinterest DIY cleaner and it worked alright in my bathroom before we moved, but I had also used other cleaners along with it. I thought I would try it again in my parent’s house to see how it really worked. The recipe is awfully simple. Pinterest has about a million different versions of the cleaner, so I honestly just winged it. I didn’t actually measure anything out. I got a bucket and estimated equal parts white vinegar and Dawn dish soap and then added some baking soda (maybe a little more than half as much as each of the other ingredients). Some sights I saw suggested warming up the vinegar before mixing it. 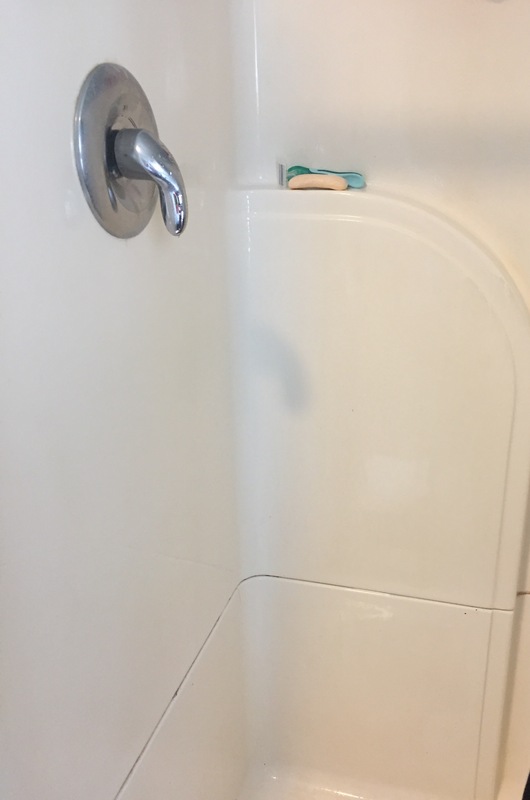 Pinterest suggests using the cleaner in a spray bottle, but I got a scrub brush and applied it to the whole shower, especially in the crevasses. Before this, I hadn’t gotten down low enough to see all of the mildew that had built up in the lower crevasse. I scrubbed my mixture in and it all came out. You can see it all over the shower walls in the photo. I let the soapy mixture sit in the shower for about an hour, then went in and rinsed it all off with water. The floor of the shower did not come completely clean, but it was definitely cleaner. The floor of this shower is impossible to get clean, I swear. It must be stained with my brother’s racetrack dirt! Gross. The rest of the shower came pretty clean. I can still see some spots that still look a little dirty on the walls. I think that this would have worked better if I had put the cleaner into a spray bottle, like Pinterest suggested. I thought I could apply the cleaner thicker by using the brush, but I think it actually just caused me to miss spots. A spray would have gone on more evenly. I think that I would use this cleaner again. It is very simple to throw together. I’m sure that it comes out to be cheaper than buying bathroom cleaners. If nothing else, you know what chemicals you’re using. I usually use Scrubbing Bubbles Bathroom Cleaner and have a headache the rest of the day and I can smell it every time I’m anywhere near the bathroom for two days. This mixture barely smelled at all. I would say that it is especially nice if you have children so you know that they aren’t breathing any harmful chemicals in. Adjust by using a spray bottle next time! Will try this next time I clean mine!